Despite being a coleopterist, I was somewhat surprised when I realized that I have not yet posted a Lepidoptera photo on this site – especially considering their abundance, diversity (2nd largest order of insects), and overall photogenicity. Time to change that. I encountered this pretty little moth at Reifsnider State Forest in Warren Co., Missouri. 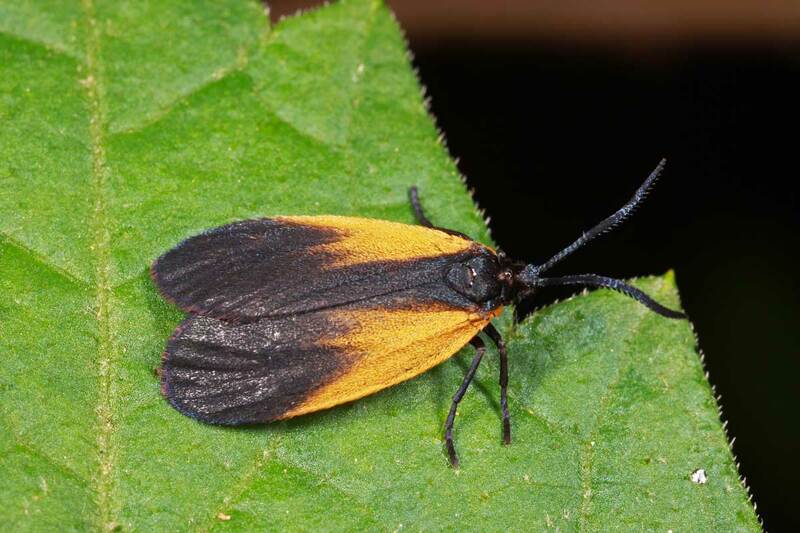 Pyromorpha dimidiata (orange-patched smoky moth) is one of the so-called “leaf-skeletonizer moths” in the family Zygaenidae. This particular species is distinguished from a similar, though unrelated species in our area, Lycomorpha pholus (black-and-yellow lichen moth, one of the subfamilies of the tiger moths, or family Arctiidae), by the black hind margin of the forewing and its phenology – L. pholus adults don’t appear until late summer. Larvae of P. dimidiata are reported to feed on leaf litter, especially oak leaves. Oaks are present in great quantity and diversity here in Missouri, and in fact this species was photographed in one of Missouri’s finest examples of a mature white oak (Quercus alba) forest – uncommon in Missouri due to the generally less mesic conditions of our upland habitats. Perhaps I like this moth because it apparently belongs to a mimicry complex involving net-winged beetles (family Lycidae), in particular the species Calopteron terminale (end band net-wing). Lycomorpha pholus also participates in this mimicry complex; however, unlike that species, P. dimidiata is itself toxic as well – all life stages of this moth contain hydrogen cyanide, which they manufacture rather than obtaining from host plants (Scoble 1992). Thus, the Calopteron-Pyromorpha mimicry complex appears to be an example of Müllerian mimicry, where both the model and the mimic are toxic. This entry was posted in Zygaenidae and tagged chemical defenses, entomology, insects, leaf skeletonizer moths, mimicry, Missouri, moths, nature, predator avoidance, science. Bookmark the permalink. Dumb question from a layman time: If both species are toxic, how do we know who’s mimicking whom? Hi Marvin – that’s actually a great question! Technically, models are not defined in Müllerian mimicry associations. In fact, the entire family Lycidae might be desribed as a Müllerian mimicry complex. However, lycid beetles also serve as models for a great many unrelated species (their black and orange or red warning coloration signal may be 2nd in popularity only to the yellow and black striping of bees and wasps). The mimicry associations in the lycid mimicry ring include examples of both Batesian mimicry, where only the model is noxious, as well as Müllerian mimicry. As the ‘leaders’ of the ring, lycids are generally referred to as the model for the whole company. Fooled me at first glance – but I claim I’m not bird-brained only my subconscious thought it would a beetle being on Beetles in the Bush. If I got stuck with Marvin’s question in class, I’d claim that lots of Lycidae are variations on this colour scheme, so moth mimicking beetle is more likely. Whenever I see Pyromorpha or Lycomorpha in the field, I have to do a double-take to make sure whether it is beetle or moth! Nice one. We don’t have that species in BC. Thanks, Ted. Since adaptation/survival depends upon predator recognition, it makes sense that the more numerous is assumed to be the model. I knew there had to be a beetle tie-in with your Lepidoptera photo somewhere! Goodness, not only do I get to learn cool things about insects, but even new uses for words. Photogenicity… I like that. 🙂 I really need to get a new camera. Thanks, Beau – it seems new cameras always offer a glimpse of an amazing new world! Very cool photo. I love moths but do not think I have taken any pictures of them! Never seen this one before. Great post, too.